An Egyptian court on Saturday upheld death sentences against 75 people, in one of the largest mass trials since the 2011 uprising, and gave a five-year jail term to an award-winning photojournalist. Amnesty International said the sentences, linked to clashes in 2013 between security forces and supporters of ousted Islamist president Mohamed Morsi, amounted to “a mockery of justice”. Photographer Mahmoud Abu Zeid was among 739 defendants on trial, most of them charged with killing police and vandalising property. 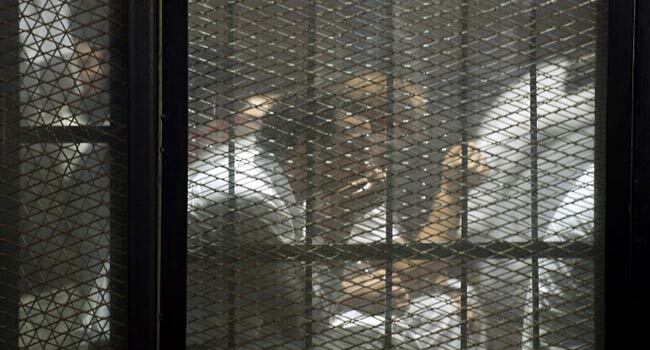 The court also confirmed death sentences initially passed in July against 75 defendants, including leaders of Morsi’s outlawed Muslim Brotherhood such as Mohamed el-Baltagui, Issam al-Aryan and Safwat Hijazi. The court sentenced Morsi’s son, Ossama, to 10 years in jail, while 215 people were handed five-year prison terms. In a statement, Amnesty condemned Saturday’s death sentences and heavy prison terms after what it called a “disgraceful mass trial”. Shawkan, who earlier this year received UNESCO’s World Freedom Prize, is expected to walk free within days because of time served, his lawyer said. Smiling in the dock, the photojournalist made a “V” for victory sign, while his lawyer, Karim Abdelrady, said he would launch a legal bid to have the conviction overturned. A photo of Shawkan — behind bars with his hands in front of his face mimicking holding a camera — has circulated widely on social media. Amnesty said he had been convicted “simply for doing his job as a photojournalist and documenting the police brutality that took place that day”. Reporters Without Borders (RSF) ranks Egypt 161st out of 180 countries on its press freedom index and says that at least 31 journalists are currently detained in the Arab world’s most populous nation. About 700 people were killed within hours at that site and Nahda Square where another sit-in was being held. Sisi won re-election with 97 percent at a vote in March against a single opponent widely seen as a token challenger, with critics saying the president had carried out a widespread crackdown on dissent.